Today is Wednesday, July 12th. BreyerFest is just now setting in as REAL! We have had a lot on our plate with our retail store grand opening on July 4th. 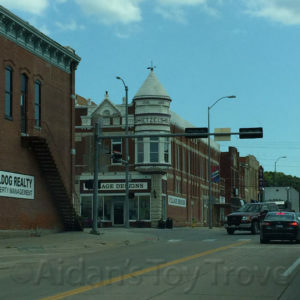 Unfortunately, with the timing of BreyerFest, we were forced to close the store shortly after opening. As much as we would have loved to take the cargo trailer to BreyerFest, the gas would have cost too much. 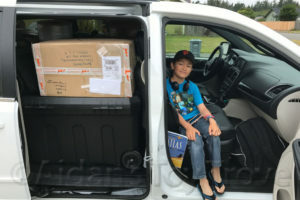 We decided to rent a minivan and fill it to the brim with plastic horses (what could be better?!) 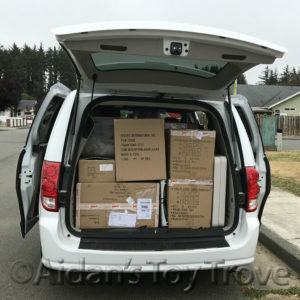 On Friday, hubby drove from Crescent City, California to Medford, Oregon to pickup our rental minivan. This is over a 2 hour drive one way. Aaaand, the rental place didn’t have the minivan that we had reserved nor could they locate one. After hours of searching and driving around, hubby was able to find a minivan but at double the price. Blargh! But we took what we could get! Here is a picture all loaded up with my show horses, Copperfox Horses, custom Steampunk Horses by Elayne Watrus and assorted sales models. If you are attending BreyerFest, we are selling out of Clarion Room 228. Aidan and hubby originally planned to leave on Friday evening but with the delay in acquiring the minivan, they weren’t able to leave until Saturday afternoon. The drive from Crescent City, California to Lexington, Kentucky is approximately 2,500 miles and 38 hours of driving. 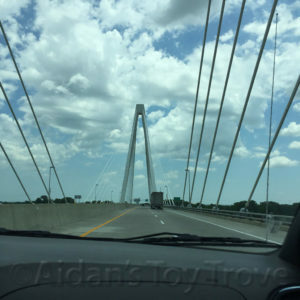 Here are some pictures from the drive. 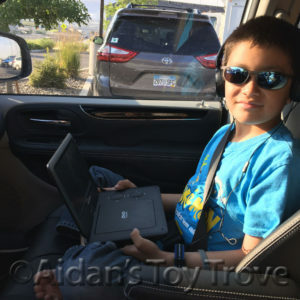 Aidan happy as a clam in Elko Nevada with his portable DVD player! 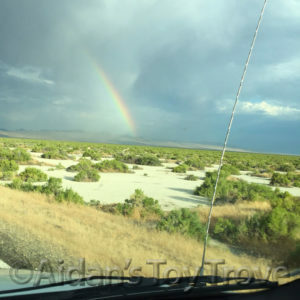 A pretty rainbow in Denlo, Nevada. 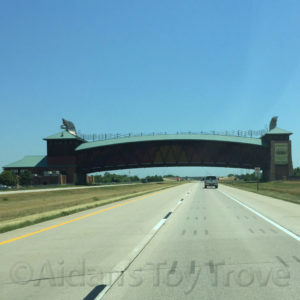 A neat bridge in Kearney, Nebraska. Getting closer to Lexington now in St. Louis, Missouri! So where have I been throughout this lengthy road trip? I’ve been at home running the website store, the eBay Store and taking care of the animals. The orange cat is Wendol and the grey cat is Alex. Alex has some health problems and requires multiple pills a day. He dropped from 14 pounds to just under 9 pounds and it has been a struggle keeping weight on him. His appetite went from insatiable to just enough to keep from losing further weight. 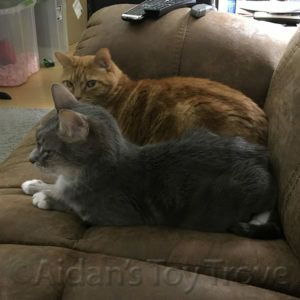 After hubby left, Alex started acting more ill than normal so I medicated him the best that I could and I’m just hoping that he makes it through the time that I am gone at BreyerFest 🙁 We have a neighbor coming over to take care of the cats and the bird. Did you think we had just 2 cats? Ha, no, that would be too easy! The black and white cat is Kit and she is Aidan’s cat. She requires a prescription diet. 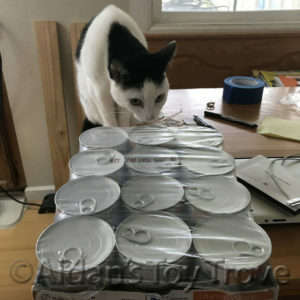 Here she is checking out her brand new case of prescription food! 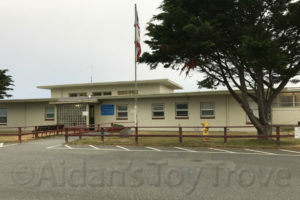 Today, Wednesday, I woke up bright and early and caught a flight out of our tiny local airport. We only have 1 terminal and a propeller plane! 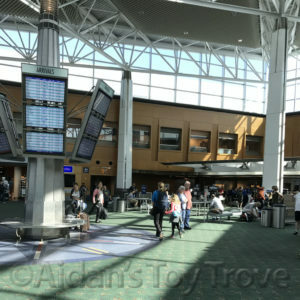 As I write this blog post, I am sitting at PDX, the main airport for Portland, Oregon. I have a 4 hour layover here and am waiting on my flight to Dallas. I roamed the airport terminals for a good spot to sit and was able to find a seat within range of the internet and with power. Hurray! I need to grab a bite to eat and then head to the terminal for my next flight. I already scoped it out and there is no internet in that terminal, BOOOOO! My estimated time of arrival in Lexington is 11:58pm tonight. On Thursday, we will check into the Clarion and start to set up room sales. I am looking forward to seeing some familiar faces and also to meeting some new ones. Safe travels everyone!